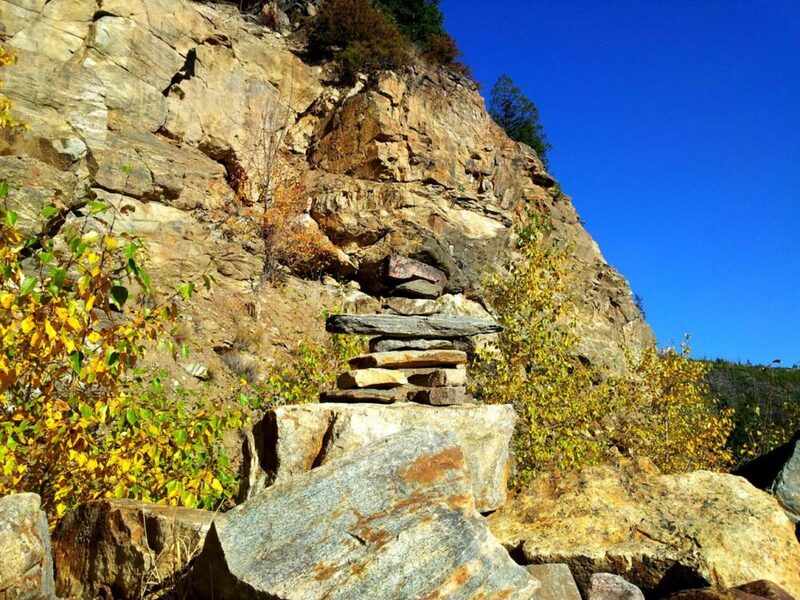 High in the hills of southeastern Kelowna is a walk/bike ride like no other. 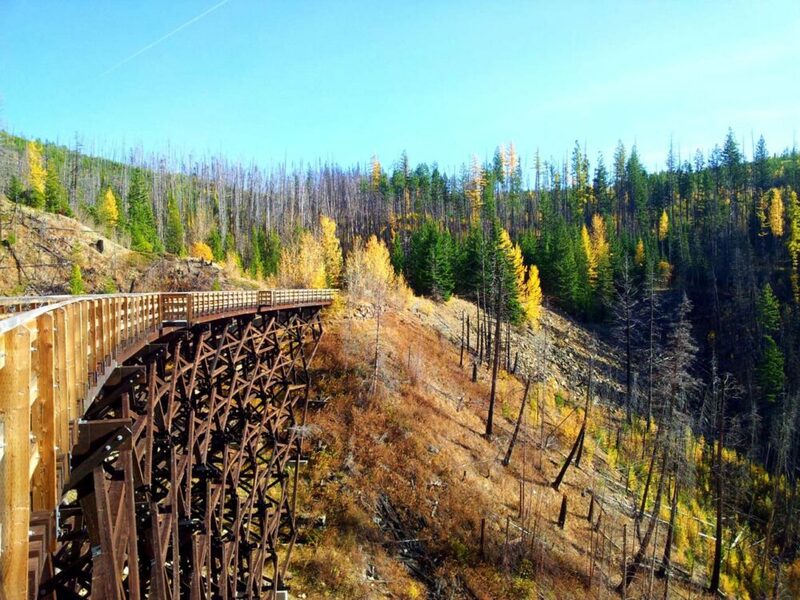 Myra Canyon is home to 16 beautiful historic trestles along the abandoned Kettle Valley Railway. Ranging up to 220m in length, these wooden railway bridges are a sight to behold. The views from them are not half bad either. 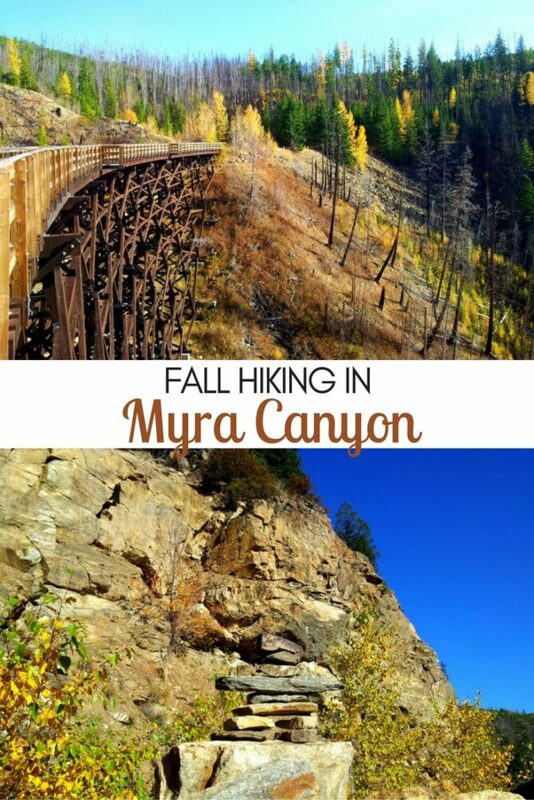 Visiting Myra Canyon in autumn offers an even more special experience. The changing colours somehow manage to enhance the wonderful views of the surrounding landscape as well as the intricate trestles themselves. 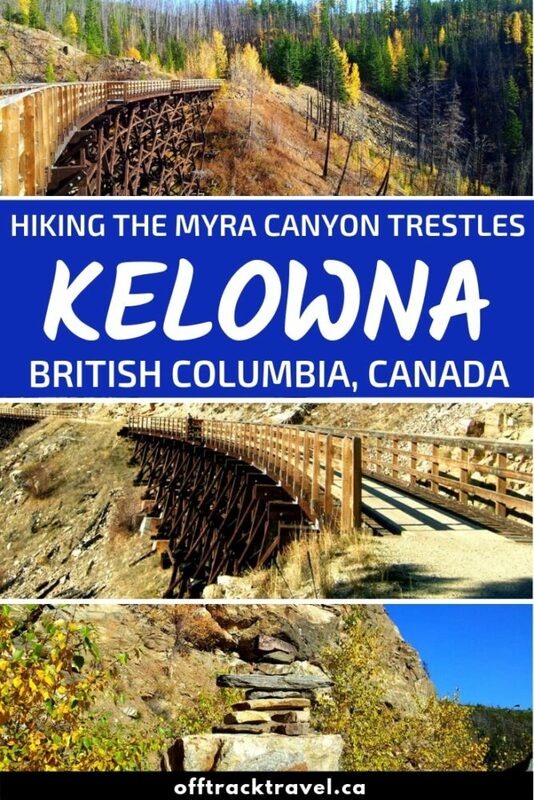 Hiking the Myra Canyon trestles is definitely not an experience to miss while in the Kelowna area! 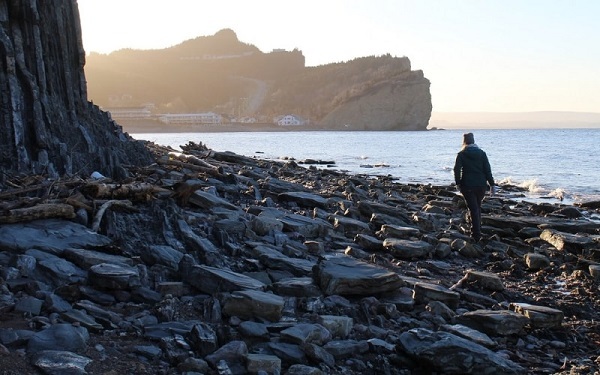 Here’s more about our hiking experience and everything you need to know to do the same. 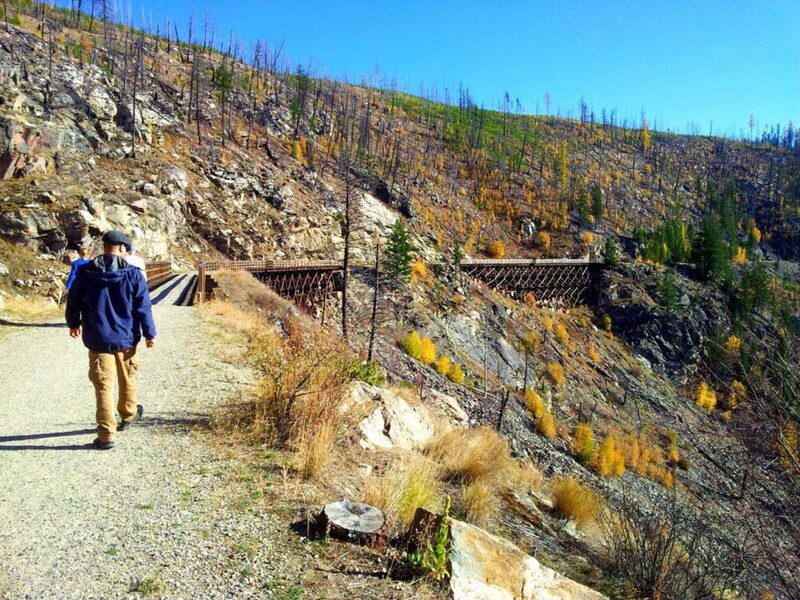 I’ve written about my love of the Kettle Valley Rail Trail before. 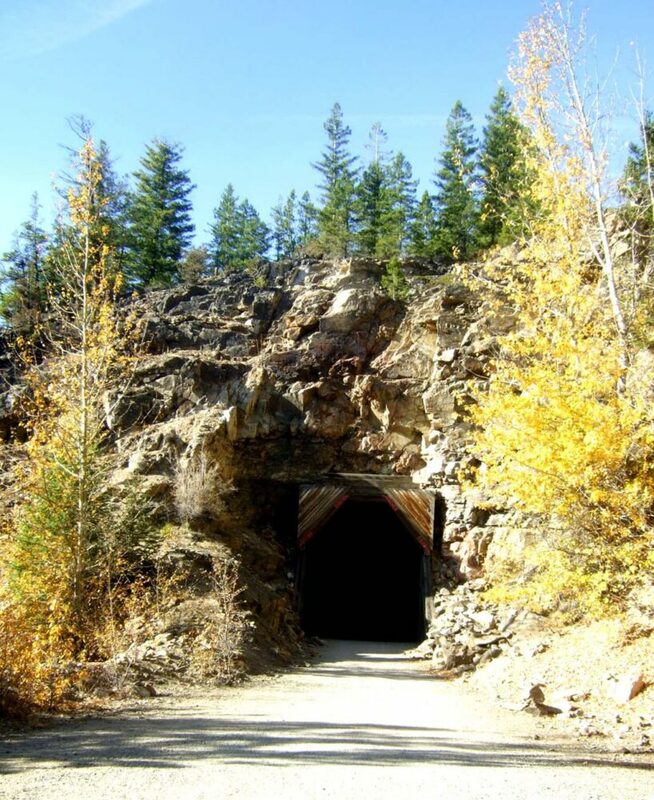 To quickly recap, the KVR was a railway line built to serve mining interests in BC’s Southern Okanagan region from 1915-1989. The maximum 2.2% grade of the route has made it an ideal recreational trail for cyclists and walkers. Myra Canyon, a long and wide chasm with several creeks running along it, proved to be difficult obstacle to cross for the railway planners. The elevation is also the highest on the entire 455km long KVR route, at 1274m. 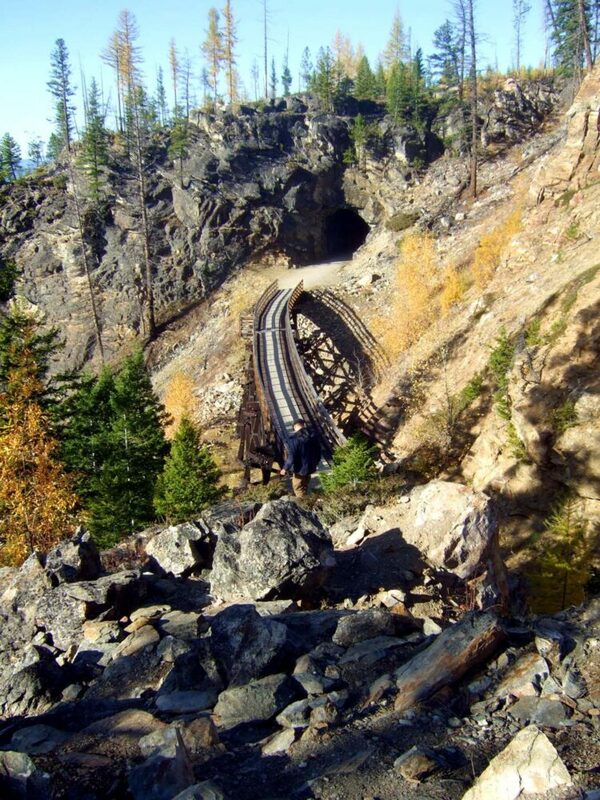 18 bridges and 2 tunnels were required to complete this tricky section of the KVR. This incredible engineering achievement continues to be appreciated today by the thousands of walkers and cyclists who visit Myra Canyon every year. Indeed, the Myra Canyon section is the most popular of the entire KVR route. 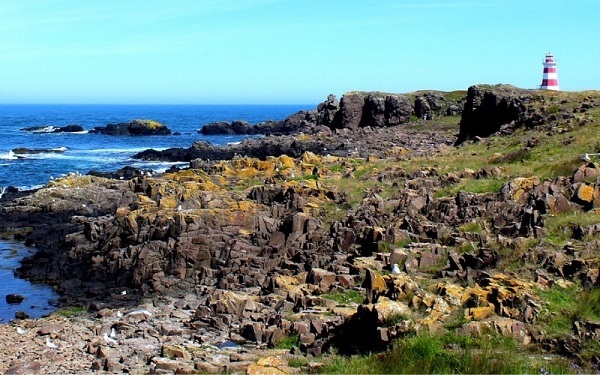 Be sure to arrive early if visiting in the summer. The pops of autumn colours on the hillsides around the trail seemed to fit perfectly with the rustic Myra Canyon trestles. 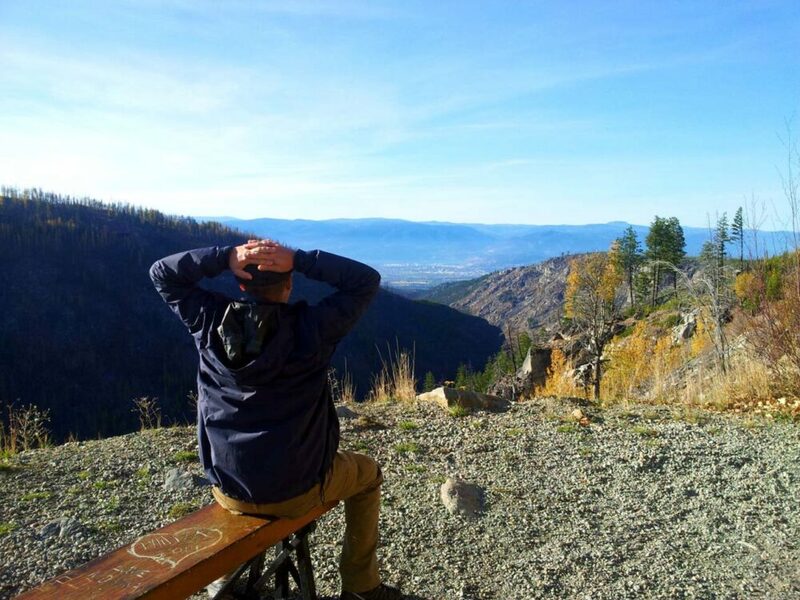 With few deciduous trees, the Okanagan Valley is not known for dramatic fall scenes in general. Myra Canyon offered a great subtle taste of what the season has to offer. Note that the elevation does make Myra Canyon feel a lot cooler than elsewhere in the Valley. 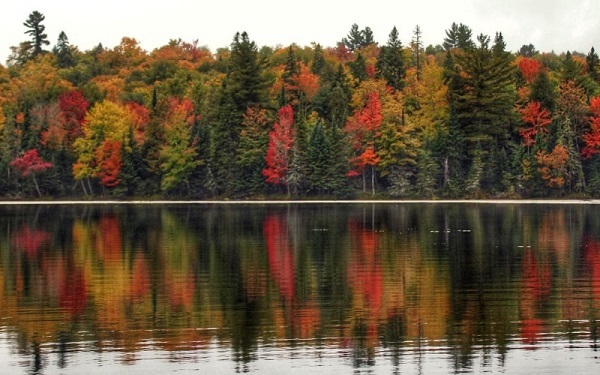 If you want to check out the colours for yourself be sure to wrap up! Looking to book a stay in Kelowna? Varying in height from 8 to 55m, the Myra Canyon trestles each have a different vantage point around the valley and across to the other trestles. The longer trestles were my favourite as they have little viewing points jutting out into the canyon. I later found that these convenient viewing stands were actually used when the railway was active to store water containers in case of fire! Most of the trestles are sadly not the original versions. 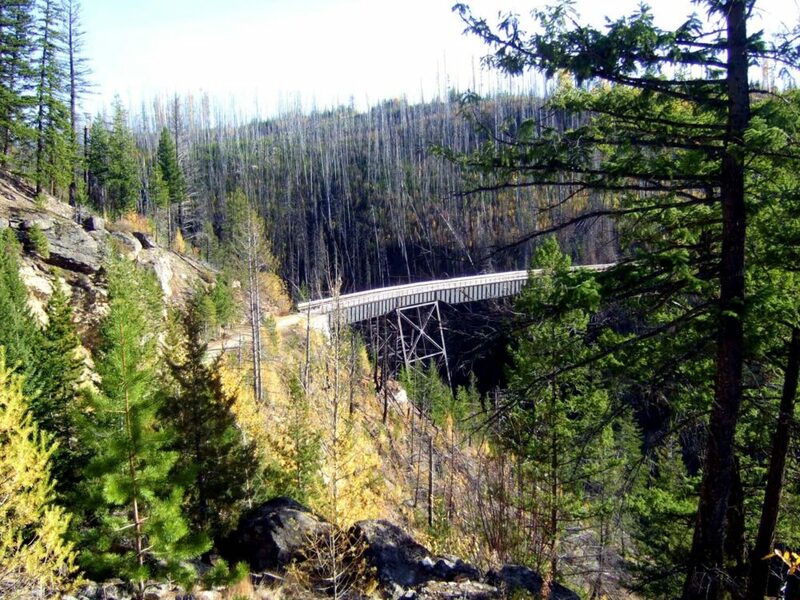 12 of the 18 trestles in Myra Canyon caught fire during the devastating 2003 Okanagan Mountain Park fire despite a multitude of efforts to save them. Rebuilt by BC Parks and volunteers using government funding, the trestles were returned to their former glory by 2008. The Myra Canyon Restoration Society continues to raise money for the maintenance of these beautiful structures. 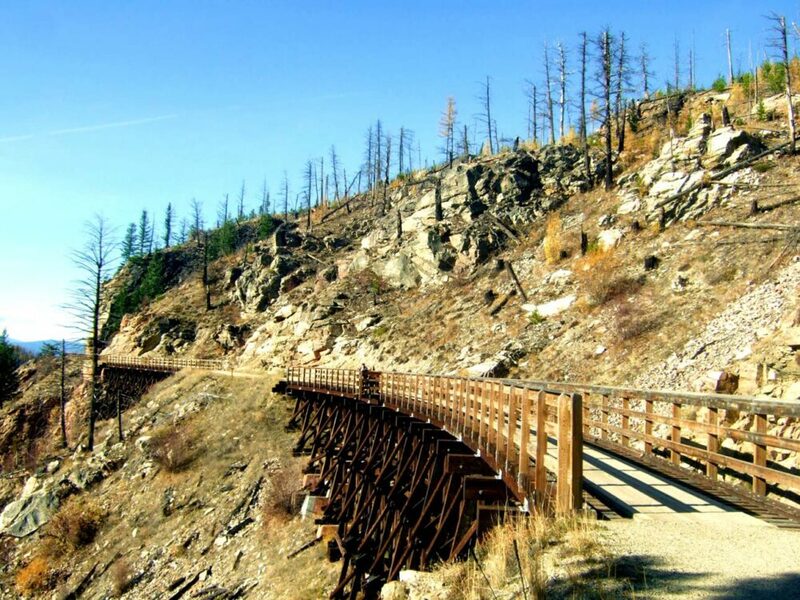 The Kettle Valley Rail Trail runs from Midway to Hope, British Columbia. 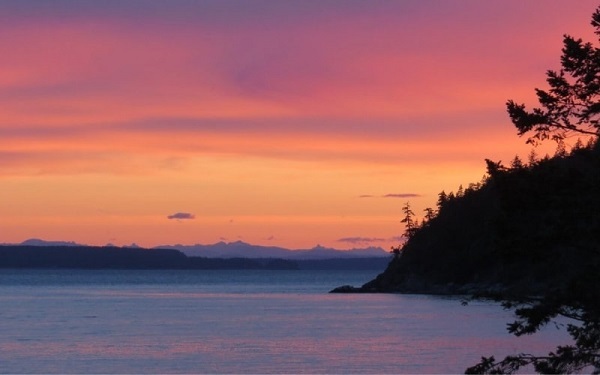 For the most part, it is a well maintained, flat gravel trail well suitable for families. 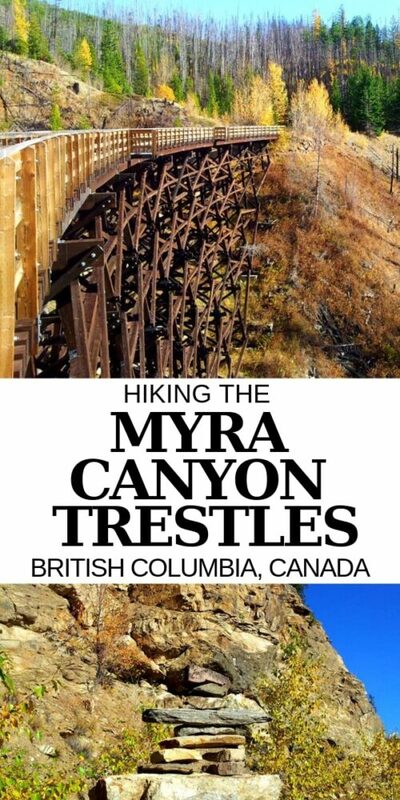 The Myra Canyon trestles are located along a section not far from the city of Kelowna. The Myra Canyon trestles can be easily reached from two main entrances, Myra Station (east) and Ruth Station (west). 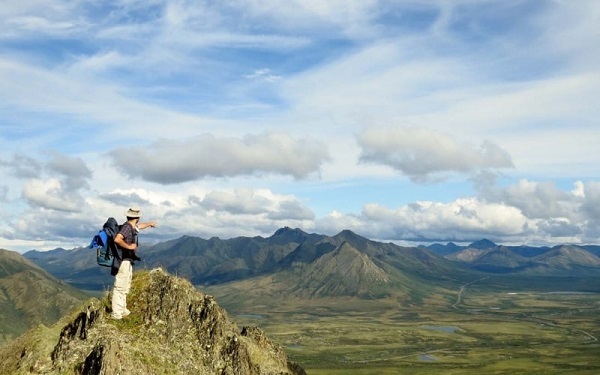 For hikers, Myra Station makes for a better day trip. A relatively short 8km return walk from here accesses 13 bridges (of 18) and 2 tunnels. We parked at Myra Station for this visit. It is completely free to park at either Ruth or Myra Station and there is also no fee to hike the Myra Canyon trestles. There are two outhouses at the Myra Station parking lot and one near the beginning of the trail at Ruth Station. If you’d like to cycle the Myra Canyon trestles, there are bike rentals available right at Myra Station from May to October. 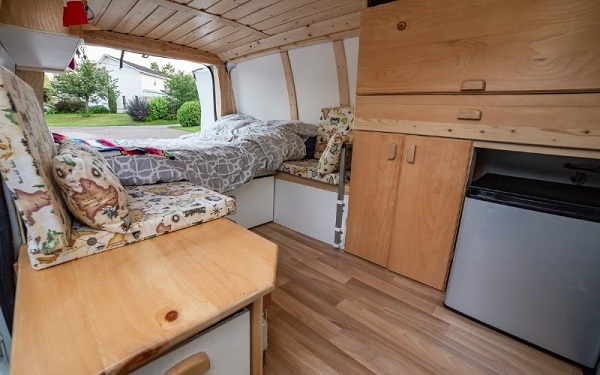 Cycling all the way to Penticton is doable in a day (around 70km) and it is possible to book a shuttle back to Kelowna. Already in Penticton? There are shuttles going to Kelowna in the morning too so you can cycle all the way home. Myra Station is an easy 40-minute drive from Kelowna. Follow the KLO Road east and then turn onto McCullough Road (side note, McCullough was the KVR’s chief engineer). Continue along McCullough until the Myra Canyon Service Road turnoff. 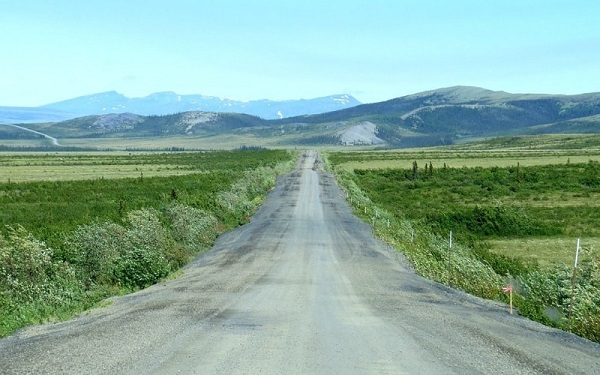 This 8km long logging road will take you all the way to the Myra Station parking lot. It is a well-maintained gravel road, which was perfectly driveable in our fairly low rental car. For Ruth Station (sometimes just called June Springs), follow the above instructions but turn off earlier on June Springs Rd before reaching Gallagher’s Canyon Golf Resort. June Springs eventually turns into Little White Forest Service Road, a logging road. This road goes to the main Ruth Station parking lot and then two more pullouts with extra parking spots further on.